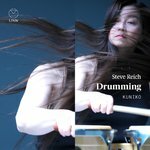 KUNIKO’s fifth studio recording sees the hugely talented percussionist return to the music of Steve Reich, a composer she has championed since her debut recording in 2011.
n Drumming KUNIKO delivers a tour-de-force performance of the work which is widely considered minimalism’s first masterpiece. Performing all thirteen parts herself, and adopting the same multi-track approach which was so successful on kuniko plays reich, KUNIKO once again displays the technical virtuosity and flawless musicianship for which she is renowned. This seminal work employs Reich’s trademark phasing technique; subtle changes in timing and timbre cause the soundscape to build through a series of rhythmic loops which gradually evolve to create a wholly immersive experience. After hearing her performance on Drumming Reich commented: "The result is like a microscopic close up of the piece where all the finest details are heard with amazing clarity". Drumming sees the award-winning percussionist once again demonstrate the musical intelligence and flair which makes such a captivating performer.